Francisco Kjolseth | Tribune file photo) Jason Dunn of Draper seeks higher, cleaner air as he rides his bike to a peak overlooking the obscured Utah county as air quality continues to deteriorate with inversion conditions trapping cold air. A new poll usggests while many Utahns are aware of the state's air quality problems, relatively few residents are taking personal action to address the issue. Search engine data show that Utahns seek out information on air quality more than residents of any other U.S. state, but a new poll suggests that doesn’t always spur them to make environmentally conscious choices. Overall, large numbers of Utahns are trying to reduce their own polluting emissions by changing up their daily transportation, according to a new Dan Jones & Associates survey commissioned by The Salt Lake Tribune and the Hinckley Institute of Politics. Thirty percent of state residents said they chose to work from home at least once over the past year in an attempt to address poor air quality. A higher share — 38 percent — said they had carpooled to reduce emissions, while just 27 percent said they took public transit. Pollsters interviewed 803 registered Utah voters over three days in mid-January for the survey, which has a margin of error of plus or minus 3.5 percentage points. To one leading Utah advocate , those findings reflect the fact that concerns over air quality have gone mainstream in Utah. But the extent to which Utahns took personal action to address air quality varied significantly depending on several factors, according to the poll — including respondents’ religious preferences. For example, 43 percent of Catholics said they had carpooled during the past year, while 14 percent of Protestants had done the same. Among members of Utah’s predominant faith, The Church of Jesus Christ of Latter-day Saints, those who attended church more frequently were less likely to take steps to reduce how much they drive. Only 19 percent of Mormons who described themselves as “very active” in the church said they had taken public transit over the past year, compared to 33 percent of less-active members and 29 percent of inactive Latter-day Saints. Soren Simonsen, a former Salt Lake City councilman and board member of the Mormon Environmental Stewardship Alliance, said he was frustrated — but not surprised — by those results. (AP file photo) The Salt Lake Temple, at Temple Square, as seen in 2018. Utahns’ personal actions on air quality varied widely depending on their religious and political views, according to a recent Salt Lake Tribune-Hinckley Institute of Politics poll. In contrast to Pope Francis, the Catholic pontiff who speaks often on environmental issues and has inspired Christians around the world with preachings on climate change and other topics, top LDS leaders have not been as vocal on that front. To Simonsen, that has meant environmental issues may not be as top-of-mind among Mormons as they could be, despite church teachings that link pollution and morality. “Moral decay and environmental pollution go hand in hand in Mormon scripture,” Simonsen said, explaining that early church leaders, including Brigham Young, associated pollution with greed and corruption. Without of a strong sense of ethical direction on environmental issues drawn from their faith leaders, Simonsen said, some Mormons have defaulted to their political views for that guidance. Indeed, the poll found a clear association between political ideology and action on air quality. Only 20 percent of respondents who identified themselves of “very conservative” said they took public transit to improve air quality. At the other end of the spectrum, 47 percent of self-described “very liberal” respondents said they took public transit. Political and religious differences aside, the survey also found that public transit was less preferred across the board, compared to other emissions-reducing actions such as working from home or carpooling. Williams said public transit is not as popular in Utah as in other states, due in part to its relatively high cost. Leah Hogsten | Tribune file photo) The Utah Transit Authority has its first new natural gas bus ready for service, June 27, 2013. A new poll finds that 27 percent of Utahns reported taking mass transit in the last year to help address air pollution. 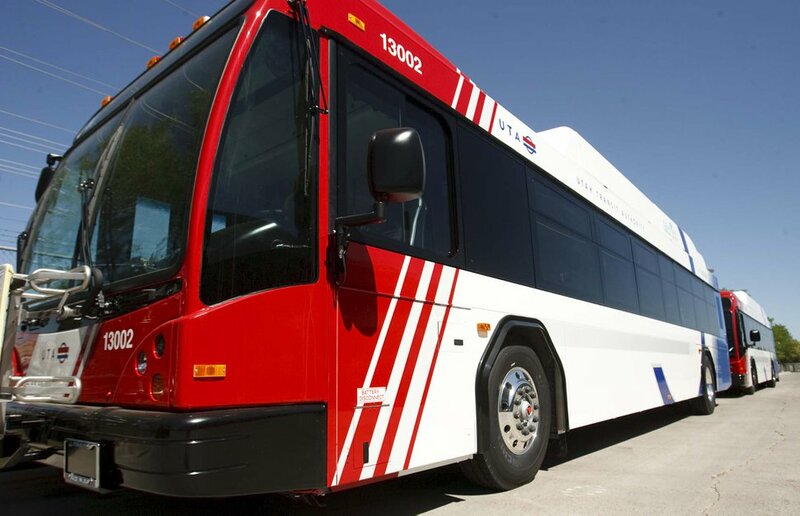 HEAL would like to see the Utah Transit Authority cut fares, or offer free fares when air quality worsens, to make public transit more accessible, especially for low-income residents, who Williams said had fewer options for reducing their daily emissions. Williams and Thom Carter, executive director of the Utah Clean Air Partnership or UCAIR, both said mass transit is not as readily available and efficient for many Utahns as it could be, discouraging them from leaving their cars behind. According to the Dan Jones poll, 31 percent of men said they had taken public transit when air quality is poor, compared to 23 percent of women. That gap may reflect special problems on transit for women with children, said Cherise Udell, founder of Utah Moms for Clean Air. Even among members of her group, Udell said, most mothers attempt to take public transit with small children and strollers once or twice before giving up, due to logistical difficulties. Carl Arky, a spokesman for UTA, said the agency didn’t see the poll numbers on transit’s relatively low popularity as an air quality solution as a sign of poor performance. “It’s not a contest to us,” Arky said, explaining that UTA is one part of a multifaceted strategy to address air quality. Even so, Arky said UTA is working to improve the efficiency of its services and to expand to reach more Utahns. But HEAL’s free fares idea could be tricky, he said.